The Hawks came out the gate fast and furious to supplement their 3-game winning streak. After a 12-1 run to start the game the Heat had to call a timeout. Al Horford and Thabo Sefolosha were leading the charge putting up 7 points a piece. Paul Millsap was coming off a game where he scored 30 points, nabbed 17 rebounds, 3 assists, 2 blocks, and 2 steals in 40 minutes. It only took 7 minutes for him to register 5 rebounds. At one point in the Hawks were up by 16 points, but they quickly let that lead slip to 4 points right before halftime. The 2nd Half looked like the beginning of the 1st for the Hawks, seeing more dominating defense and accurate shooting. 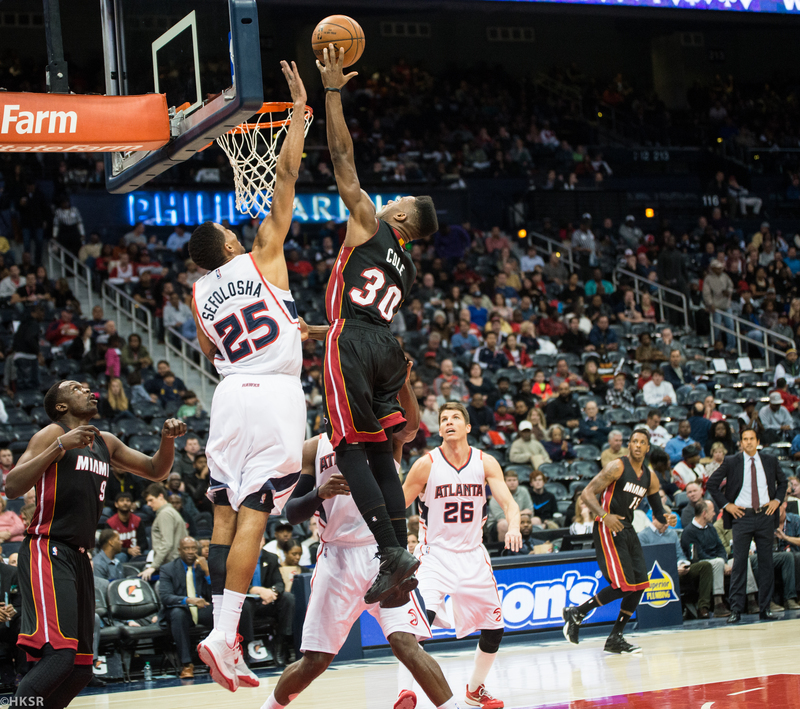 Although Miami outscored the Hawks 27-24 in the 3rd Quarter, the Hawks dominated the 4th, holding the Heat to only 8 points. With 5 minutes left in the game, the Heat found themselves down 104-87. Chris Bosh led the Heat with 20 points and 4 rebounds. Udonis Haslem (6) and Shawne Williams (5) both out-rebounded Bosh but also led in personal fouls. The Heat were out of sync for the majority of the game aside from their run that brought the game within 4 points before halftime. With 2:50 left to go the Hawks led 106-93 and were comfortably dominating the clock and the floor. Paul Millsap was having another monster game with 19 points, 9 rebounds, and 2 assists. As a whole, the team was shooting 56% and made 83% of their free throws (19/23). Al Horford also had 19 points with 6 rebounds and 4 assists. Chris Bosh ended up leading the team in rebounds with 8, while Mario Chalmers led the Heat in points (23) and assists (11). The Hawks are enjoying their current run of form. With tonight’s win they’ve now won 4 games in a row and are quickly moving up in the Eastern Conference. Their next game is Saturday against Cleveland (away) but their next home game is Tuesday, November 18 against Kobe and the Lakers.